Who knows about wind then? Quote Reply Topic: Who knows about wind then? This is windy Weymouth this morning. 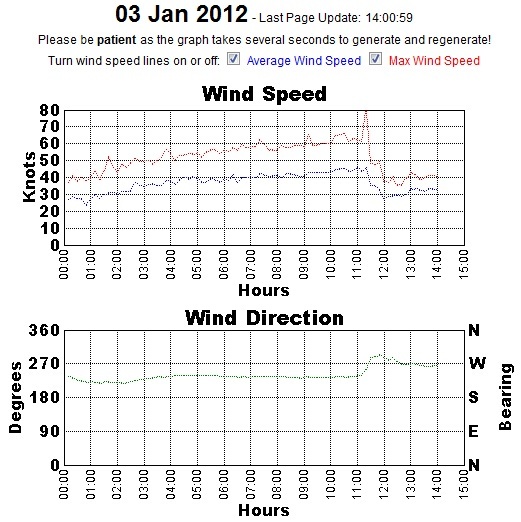 You can see the wind gradually building through the morning then a big spike at 79.4kts(!!) followed by a sudden drop and a swing in direction. What causes the spike? The spike coincides with the cold front passing over. In front of the front (blue) the isobars are close together (high wind), as the front passed the wind veers more to the West and the isobars are more spread out (lower wind). Mmm. Picture paints a thousand words and all that. To be honest I didn't appreciate the wind blew parallel to the isobars. Presumably the spike is equivalent of a bow wave? 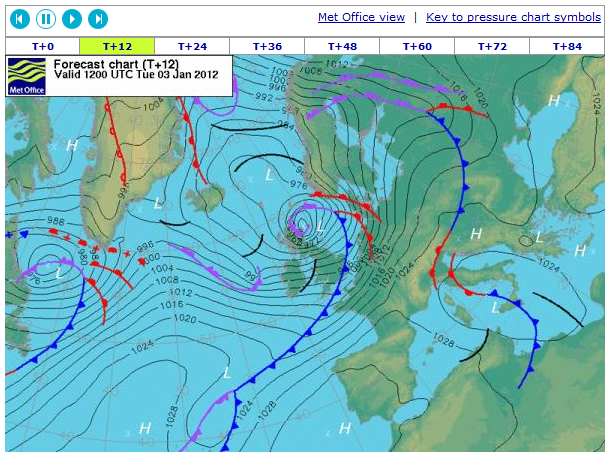 On a low pressure isobar, the wind runs anticlockwise along the isobars rather than parallel. Really strong gusts are generally colder heavier air coming down from higher up and lots of things can concentrate them, like a load of water suddenly coming down behind or to the side of them, just as it can have the opposite effect (rain). It was sheeting down here just before the wind dropped and veered (did it veer never can remember if its veering or backing when it goes round to the North West as it generally does after rain or a front going through. I worked out why it did it once whilst watching a particularly heavy and localised squall and wondered if it did the opposite in the Southern Hemisphere..
in central Scotland, we had a massive spike at around half-six this morning- proper house shaking stuff- followed by hours of "bloody hell"- something like 97mph in Glasgow, 105mph in Edinburgh. I was supposed to be taking a train back to the uncivilised south, but instead I'm still a sensible distance north. For some reason i'm drinking Kentish beer mindyou.